This deep chocolate brown moto jacket adds an unexpected color to the mix. Would love it with an all black outfit like mine above! For a jacket just like mine for under $100, try this one by ASTR. A couple other fabulous fall colors to check out are this olive style and this plum shade. So pretty! If you’re a fan of bomber jacket silhouettes, this one is amazing! Another gorgeous grey style from Zara for under $100 – looks so luxe! PS – don’t you just love my new boots? I was on the hunt for a comfortable pair of flat ankle boots that weren’t clunky and had a bit of edge to them. This pair totally fits the bill. Effortlessly cool, don’t you think?! loving this jacket and those boots are amazing. I love me a good suede jacket! Under $200 is such a great price point. Chic look! what a great round up of options! I think I need that BlankNYC biker style in coffee bean. Love it. Also, adoring your look. Very chic all black with that gorgeous grey suede is so perfect. So cute Merritt!! 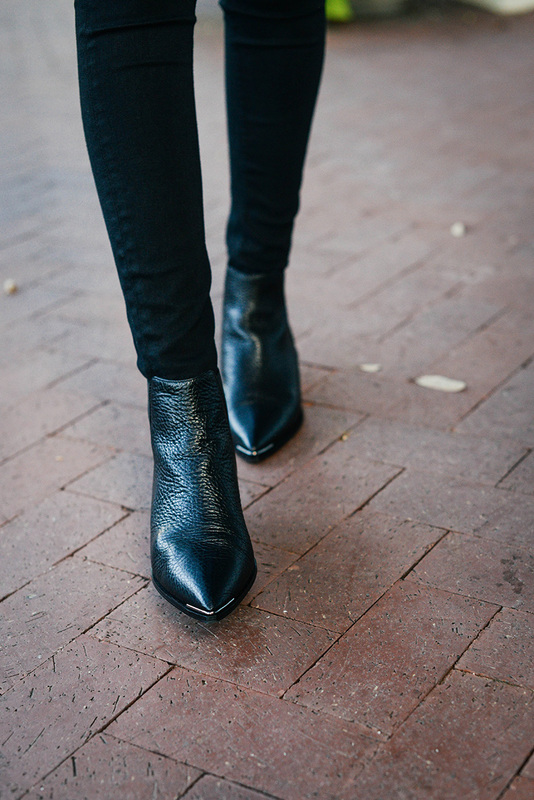 Love the moto style and I’m really loving those booties!!! Love the jacket, but I REALLY love those booties! So cute to wear all. the. time. Very nice look! Great jacket!